A man walks past a Lumber Liquidators store, Thursday, March 12, 2015, in Philadelphia. Lumber Liquidators' stock plunged Monday as the Centers for Disease Control and Prevention now says people exposed to certain types of the company's laminate flooring were three times more likely to get cancer than the agency previously predicted. The CDC said that in its original report it had used an incorrect value for ceiling height. It said that resulted in health risks calculated using airborne concentration elements about three times lower than they should have been. It now estimates the risk of cancer at six to 30 cases per 100,000 people. It previously estimated two to nine cases per 100,000 people. The agency said that its recommendations will likely stay the same -- that people take steps to reduce exposure. 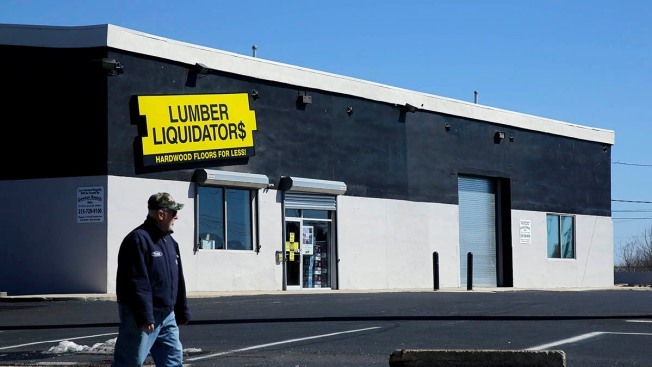 Lumber Liquidators said in a statement Monday that it has strengthened its "quality assurance procedures," such as testing sample products. The company stopped selling Chinese-made laminate floors in May, a few months after CBS news show "60 Minutes" reported that those floors contain high levels of the carcinogen formaldehyde. Lumber Liquidators, based in Toano, Virginia, also began providing customers with free air quality tests. On its web site, the company is offering air-quality test kits to users. For more information on the kits, click here. Earlier this month, it was announced in a separate case that Lumber Liquidators would pay more than $13 million for illegally importing hardwood flooring, after the company pleaded guilty to environmental crimes last year. The company pleaded guilty to environmental crimes in October. Shares of Lumber Liquidators Holdings Inc. slid $2.38, or 16.8 percent, to $11.78 in morning trading Monday. Its shares have fallen almost 83 percent over the past year.